The bi-annual Essex History Fair was held at Labworth Recreation Ground Canvey Island on Sunday 11th July 2004. 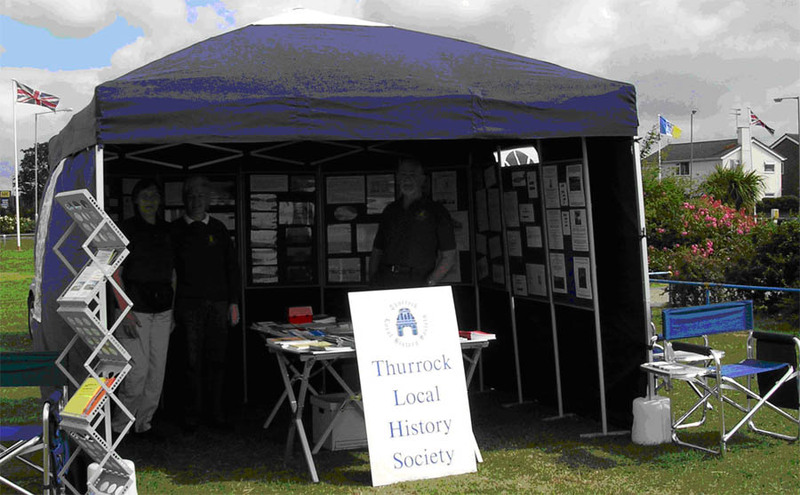 Thurrock Local History Society had a display featuring pictures of old Thurrock and queries received on their website. The display housed in the Societys own gazebo was very professional and several visitors said they thought it was the best in the show. One gentleman even suggested we should receive a prize for our exhibit and that the quality of our journal made it one of, if not the best in Essex. Peter Wright chairman of the organising committee also complimented T.L.H.S. on the quality of their display. You can judge for yourselves see the picture above. There were displays from many other Societies including Waltham Abbey Historical Society, Walthamstow Historical Society, Essex Archaeological Congress, East of London Family History Society, South Essex Family History Society. Unfortunately almost all of the Societies represented were from South Essex with the exception of Clacton. The Fair followed its usual format and this years lectures which included one on the recent Prittlewell excavations were held in the adjacent Amusement Arcade. The main arena was the venue for the various re-enactments. As in previous years there were many people in period costume as well as clowns, and strolling players. There was also a static military display as well as childrens entertainment. The weather was fine and whilst there was a short burst of rain during the afternoon for the most part the weather was good and as a result the attendance was better than most people expected.